UAA ski coach Sparky Anderson was walking across the parking lot of the Alaska Airlines Center on city campus early Thursday morning, lugging a bundle of alpine racing gates over his shoulder, when he answered his cellphone. It was Athletic Director Keith Hackett, calling with good news. The Seawolves alpine and nordic teams, among four UAA sports targeted for elimination because of pending budget cuts, no longer sat dead-center in the fiscal crosshairs. That's when the coach turned athlete, happily hustling to the weight room to share the news with skiers training there. "I just walked in and said, 'We won!' Everybody was high-fiving and hugging,'' Anderson said. Men's and women's skiing at the University of Alaska Anchorage and University of Alaska Fairbanks and men's and UAA women's indoor track and field were spared when University of Alaska President Jim Johnsen reversed his previous recommendation to the UA Board of Regents to eliminate those sports. Johnsen switched course after learning the NCAA would not preemptively grant UAA and UAF waivers to allow them to dip below the 10-team minimum for Division II members. UAA has 13 sports and UAF 10. The NCAA said it would only consider a waiver after the schools eliminated sports, Johnsen told regents, and he considered that prospect too fraught with peril, including possible sanctions. "That risk is much too great,'' Johnsen told regents. The 11-member board voted 8-0 to support Johnsen's recommendation to spare the athletics teams. Student member Stacey Lucason abstained, Mary Hughes was absent and Deena Paramo, superintendent of the Anchorage School District, was apparently away from her phone at the time of the board's vote. Also scrapped was the complex idea of asking the NCAA to allow UAA and UAF to form a consortium, with some sports based in Anchorage and others in Fairbanks. Such an arrangement between two schools so geographically separated is unprecedented in NCAA history. The waiver from the 10-team rule and the consortium arrangement were two budget-cutting options that stemmed from UA's Strategic Pathways. The study aimed to increase efficiencies and suggest across-the-board cuts at UA's three main campuses – cuts to academics, athletics, infrastructure, information technology, you name it. UAA alpine skier Charley Field said she was in the school's library early Thursday morning when a teammate texted her Anderson's good news. Field, a junior, said she was all smiles when she attended her organic chemistry class at 8:30 a.m.
After Johnsen announced his initial recommendation to eliminate skiing and indoor track two weeks ago, the ski communities in Anchorage and Fairbanks proved particularly vocal in defending Seawolves and Nanooks skiing. 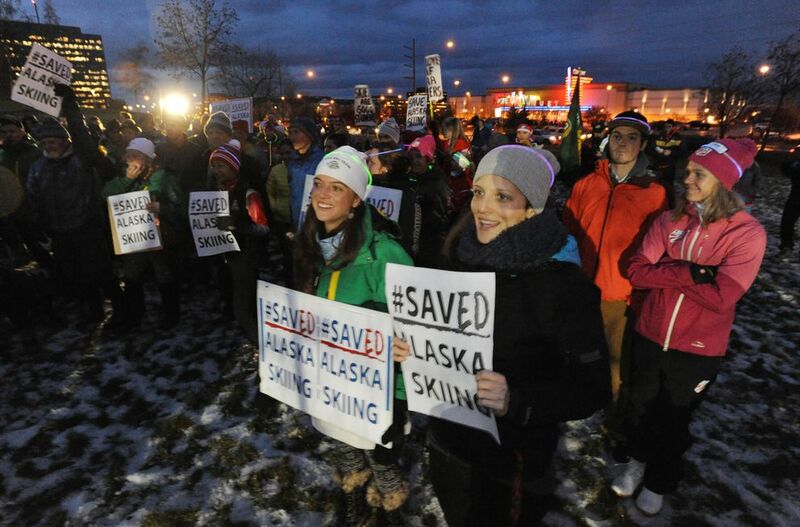 Supporters contacted regents, started a website – Save Alaska Skiing – and received more than 5,000 signatures on a petition. The group held rallies in Anchorage and Fairbanks on Thursday evening. "Look at what we accomplished," rally co-organizer Andre Horton told the Anchorage crowd of about 250. "… At one point yesterday, the Board of Regents was getting an email (about skiing) every two minutes." Regent Kenneth Fisher said at Thursday's meeting the number of people who encouraged him to spare skiing exceeded public concern on any other subject in his eight-year tenure. Field said she and her teammates were thrilled the ski community rallied to their aid. The financial crisis UA faces due to Alaska's multibillion-dollar budget deficit means athletic budgets will still be cut for fiscal year 2018, which covers the 2017-18 school year. The UAA athletic department, which has made cuts in each of the last two years, is projecting $1.9 million in cuts to its $10.3 million budget and UAF is looking at a $800,000 reduction for its $6 million budget. For UAA, cutting alpine and nordic skiing and indoor track would have saved $700,000 to $725,000. For UAF, cutting nordic skiing would have saved $400,000. Johnsen said supporters of athletics will be counted on for fundraising. "I believe we can actually push aggressively supporters of our athletic programs to generate financial support from the private sector,'' Johnsen said. That works for Michael Friess, UAA's longtime running coach. He said sports bring value to the university and community by molding leaders, gaining publicity and delivering an economic impact. But he agrees UAA must increase attendance and find ways to raise money to mitigate budget cuts. Friess doubles as the race director for the Mayor's Marathon and Half-Marathon, which this year netted the school a profit of about $100,000, and he aims to increase race participation, and profit in 2017. Friess praised Johnsen for due diligence in crystallizing UA's budget crisis for universities and the public. UAA's Hackett said Thursday's news was welcome, but also signaled earnest labor ahead to turn community support into financial support. "The most important thing from the decision by the NCAA and President Johnsen is it benefits our student-athletes,'' Hackett said. 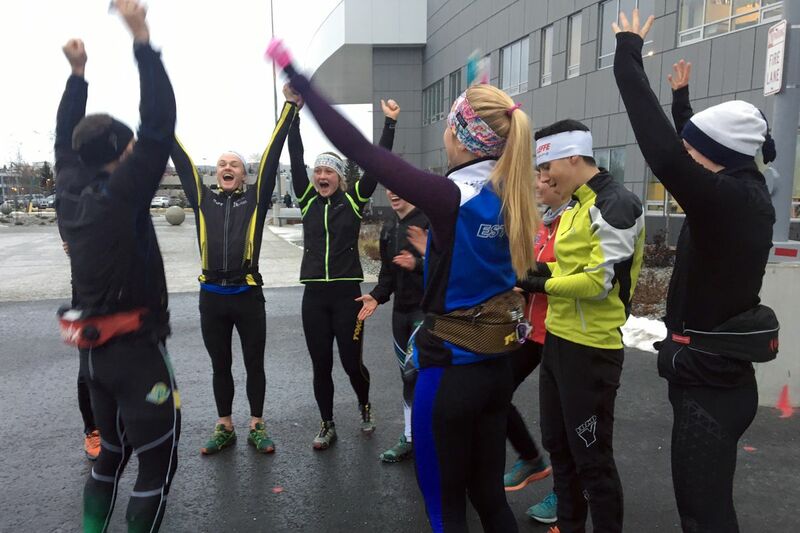 "It's a terrific day for athletes at UAA and UAF. Anderson, UAA's head ski coach, said he believes the ski team can harness momentum its supporters generated. UAA's alpine team is scheduled to depart Anchorage on Friday morning for its annual training camp in Loveland, Colorado. Field thinks she and her teammates will hit the slopes with particular relish now that they no longer lug around the burden of their team's potential demise. "Now we can focus on skiing,'' she said. Reporters Tegan Hanlon and Beth Bragg contributed to this report.